Internet TV is getting mass popularity with the availability of high speed broadband connections . These online streaming Television channels can be accessed either using an online website with embedded player or custom desktop applications built for Windows ,Mac and Linux . Till now we have reviewed a couple of online TV applications for Windows . 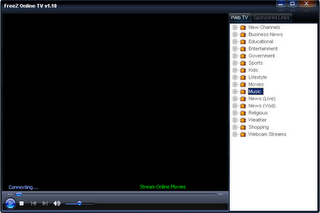 Most of them were sharewares or freeware with ads or channel limitations .Freez is a similar light weight online TV application for Windows . Though the application is a foolware for listing some channels like MTV , it manged to play few other less popular channels . You will be amazed to see the number of channels listed . But unfortunately most of them will keep buffering infinitely .Freez online TV uses Windows media player to connect with streaming IP address of online televisions to play them . Freez also needs a broadband connection for playing online TV channels . It will try to install an optional conduit toolbar during installation process . Opt out that to avoid hijacking of your browser with bandwidth consuming toolbar .